Note: Be sure to add "Predictive_Analytics_Times@mail.vresp.com" to your address book to ensure future event notifications are not captured by your SPAM filter. 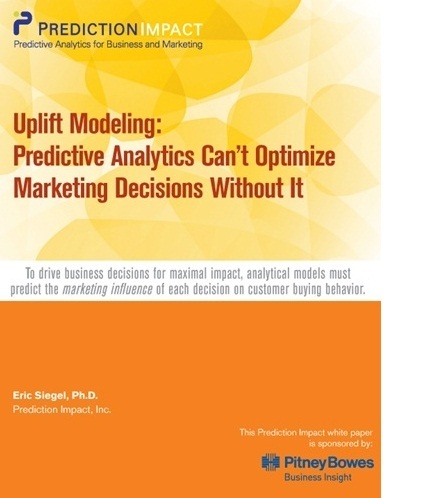 Predictive Analytics Can't Optimize Marketing Decisions Without It"
To drive business decisions for maximal impact, analytical models must predict the marketing influence of each decision on customer buying behavior. Uplift modeling provides the means to do this, improving upon conventional response and churn models that introduce significant risk by optimizing for the wrong thing. This shift is fundamental to empirically driven decision making. This convention-altering white paper, sponsored by Pitney Bowes Business Insight, reveals the why and how, and delivers case study results that multiply the ROI of predictive analytics by factors up to 11. For organizations with multiple lines of business and deep, rich databases, making sense of information has become a business itself. What is needed now, more than ever, is a good translation layer to ground businesses in fact-based decision making. The translation layer is defined as the role that analytical people play, or ought to play, within organizations to bridge the gap between information and powerful business applications. This webinar illustrates why the analytics community must evolve to increase the impact they have on the organizations where they work. David A. Ferrucci, IBM Fellow and Watson Principal Investigator, IBM Research. Speaking on: "Building Watson - An Overview of the DeepQA Project"
The full conference agenda for Predictive Analytics World NYC has been posted. Predictive Analytics World focuses on concrete examples of deployed predictive analytics. The leading enterprises have signed up to tell their stories, so you can hear from the horse's mouth precisely how Fortune 500 analytics competitors and other top practitioners deploy predictive modeling, and what kind of business impact it delivers. PAW's NYC 2011 program is the richest and most diverse yet, featuring over 40 sessions across 3 tracks: 1) "All Audiences", 2) "Expert/Practitioner", 3) "Financial Services" -- so you can witness how predictive analytics is applied by ACE Cash Express, Blue Cross, Charlotte-Mecklenburg Police Dept., Citibank, Cox Communications, Fidelity, GE Capital, Heritage Provider Network, Infinity Insurance, Intuit, LinkedIn, Match.com, Microsoft, New Directions Behavioral Health, New South Wales Government, Overstock.com, Paychex, Inc., PayPal, Rebellion Research, United Group Holdings, USPS Office of Inspector General, YMCA, a top 5 international bank, a top global retailer, and three major US banks, plus insights from projects for Anheiser-Busch, the SSA, and Netflix. PAW NYC's agenda covers black box trading, churn modeling, crowdsourcing, demand forecasting, ensemble models, fraud detection, healthcare, insurance applications, law enforcement, litigation, market mix modeling, mobile analytics, online marketing, risk management, social data, supply chain management, targeting direct marketing, uplift modeling (net lift), and other innovative applications that benefit organizations in new and creative ways. Track 3 sessions are entirely within this industry. The new conference Text Analytics World, co-located with PAW NYC, provides reasonable cross-registration options. PAW also features several full-day pre- and post-conference workshops that complement the core conference program. Workshop agendas include advanced predictive modeling methods, hands-on training, text analytics, a bootcamp and full-day intro to R (the open source analytics system), enterprise decision management, user-friendly deployment, and introductions to predictive analytics and to business analytics. Download the conference preview guide for an in-depth look at Predictive Analytic World's all-star speaker line up and array of case studies, coming to NYC October 16-21. Attendees will have the opportunity to hear first-hand how their peers and industry experts are using predictive analytics to improve efficiency, reduce risk, and increase profits across a wide range of industries. Text Analytics World NYC is the business-focused event for text analytics professionals, managers and commercial practitioners. This conference delivers case studies, expertise and resources to leverage unstructured data for business impact. Text Analytics World focuses on concrete examples of deployed text analytics. Hear from the horse's mouth precisely how Fortune 500 analytics competitors and other top practitioners employ text analytics, and what kind of business impact it delivers. TAW New York City will feature over 25 sessions with case studies form leading enterprises in automobile, educational, e-commerce, financial services, government, high technology, insurance, retail, social media, and telecom such as: Accident Fund, Amdocs, Bundle.com, Citibank, Florida State College, Google, Intuit, MetLife, Mitchell1, PayPal, Snap-on, Socialmediatoday, a Fortune 500 global technology company, plus special examples from U.S. government agencies DoD, DHS, and SSA. TAW New York City's agenda covers hot topics and advanced methods such as churn risk detection, customer service and call centers, decision support, document discovery, document filtering, financial indicators from social media, fraud detection, government applications, insurance applications, knowledge discovery, open question-answering, parallelized text analysis, risk profiling, sentiment analysis, social media applications, survey analysis, topic discovery, and voice of the customer and other innovative applications that benefit organizations in new and creative ways. Predictive Analytics World for Government, September 12-13 in Washington, DC, is the first vendor-neutral predictive analytics conference for the government, designed to help agency managers understand how they can apply predictive analytics to more effectively and efficiently accomplish their mission. 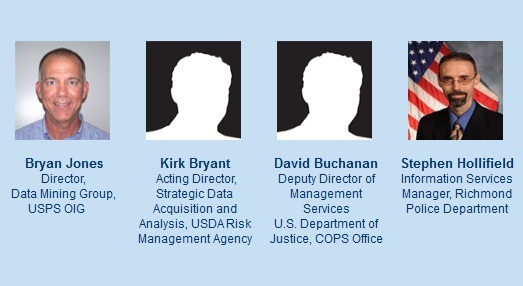 Case studies from Federal, State, and Local agencies such as Department of Justice, USDA Risk Management Agency, USDA Food Safety and Inspection Service, U.S. Postal Service Office of Inspector General, Department of Treasury, Department of Defense, National Security Agency, New South Wales Department of Transportation, Mexico Tax Administration Service, NASA, and Defense Finance and Accounting Service. Hot topics and advanced methods covering fraud detection and prevention, text mining, law enforcement, food safety, grants management, hotspot detection, optimization of facilities, ensemble models, supervised/unsupervised predictive modeling, crowdsourcing, and other innovative applications that benefit organizations in new and creative ways. Predictive analytics reduces fraud, waste, and abuse, automates manual processes, maximizes productivity of agency personnel, and drives smarter decisions by extracting actionable insights from the vast quantities of data within government agencies. PAW London 2011 will feature over 20 speakers from 8 countries with case studies from leading enterprises in e-commerce, finance, healthcare, retail, and telecom such as: ENERGEX, GlaxoSmithKline, Hewlett Packard, ING Belgium, JustGiving, Lloyds TSB General Insurance, OTTO Group, Paychex, The Royal Bank of Scotland, United Group Holdings, US Bank, and Yahoo! Plus special examples from U.S. government agencies DoD, DHS, and SSA. PAW London's agenda covers hot topics and advanced methods such as churn modeling, demand forecasting with predictive models, discovery of technology trends, financial services, human resource retention, non-profit fundraising, online ad optimization, pharmaceutical applications, project management for analytics, risk management, supply chain management, text analytics, uplift modelling (net lift), and other innovative applications that benefit organizations in new and creative ways. Post-conference workshop, Friday 2nd December in London: "The Best and the Worst of Predictive Analytics: Predictive Modeling Methods and Common Data Mining Mistakes" - with Dr. John Elder. A free copy of John Elder's book Statistical Analysis and Data Mining Applications is included. 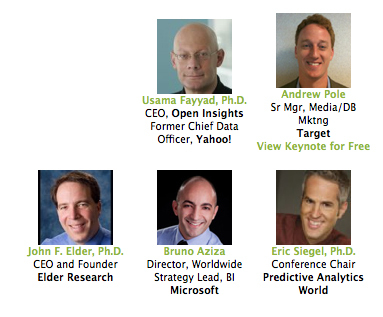 What's Predictive Analytics World all about and why should you go? 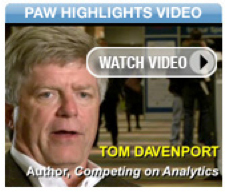 Watch the video overview of PAW, including statements from Thomas Davenport, conference chair Eric Siegel, and other conference participants and VIPs. How do you define analytics? What elements are necessary for an organization to be most successful with analytics? How can organizations evaluate the success of their analytics investment? What are the challenges of measuring ROI versus the level of investment? Do you have some advice for an organization that is just beginning to dip their toes into analytics? "If you can predict it, you own it: Four steps of predictive analytics to own your market." What are the hottest trends in analytics? Eric Siegel, Ph.D., Conference Chair of Predictive Analytics World and Text Analytics World, expands on the innovative approaches of using social data, text analytics and net-lift modeling in this video. He says that analyzing social data - or "what people's friends are doing" - improves predictive models. He also explains that structured, tabular data from applying text analytics to unwieldy unstructured data is a significant source to better predict customer behavior. Lastly, Siegel says that net-lift modeling offers a more complex approach than traditional modeling, as it tells organizations which customers will be receptive to retention offers. Predictive analytics is business intelligence technology that produces a predictive score for each customer or prospect. Each customer's predictive score informs actions to be taken with that customer - business intelligence just doesn't get more actionable than that. "How Target Gets the Most out of Its Guest Data to Improve Marketing ROI"
PAW DC videos feature over 25 speakers with case studies from leading enterprises such as: CIBC, CEB, Forrester, Macy's, MetLife, Microsoft, Miles Kimball, Monster.com, Oracle, Paychex, SunTrust, Target, UPMC, Xerox, Yahoo!, YMCA, and more. Business metrics do a great job summarizing the past. But if you want to predict how customers will respond in the future, there is one place to turn - predictive analytics. By learning from your abundant historical data, predictive analytics provides the marketer something beyond standard business reports and sales forecasts: actionable predictions for each customer. These predictions encompass all channels, both online and off, foreseeing which customers will buy, click, respond, convert or cancel. If you predict it, you own it. The results are in for the Rexer Analytics 2010 Data Miner Survey. From the most popular software tools to which verticals have embraced modeling - results across 50 surveyed items - the Rexer Analytics 2010 Data Miner Survey report is truly a valuable resource. If this newsletter was forwarded to you, you may subscribe here.